Noticeboards, such as the one above are fairly standard outside most meeting houses. Usually they consist of space for Quaker posters plus information about the Meeting as a worshipping community. However, there are likely to be other places within the building that have notices meant to be read by people using the building. When was the last time you looked at the various display areas around the meeting house? Are they tidy and updated regularly, so that any new information can be found? Do they convey the messages and tone that you want them to? Do the messages/notices/tones need to be updated? 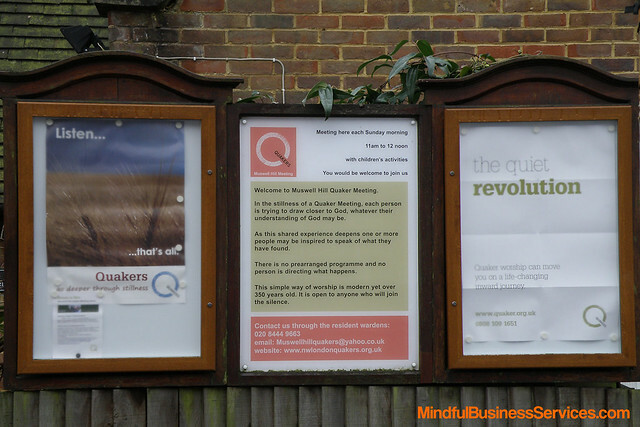 Have the Quaker posters been changed recently to attract more interest? Are they interesting enough for you to stop and read them? In the Marketing your meeting house the basics I mentioned that another type of noticeboard can be useful for both outreach and marketing. This is just a summary – to read more click through to the full article. 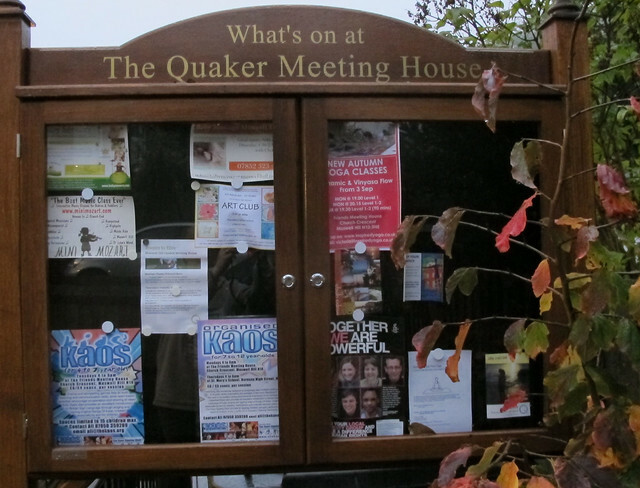 Outreach – people who are looking for a class or an event realise that the building exists – and may even realise that Quakers exist too. If they come onto the site to look at the noticeboard, or have at least become more familiar with the building, it increases the likelihood that they will feel able to cross the threshold and actually attend one of your outreach events. Marketing – you can of course put your own meeting’s events here – they are happening at the meeting house after all. It also gives some marketing to the groups using the building, supporting them and hopefully ensuring that they stay in business and hiring from you. This entry was posted in Marketing, Outreach, Quaker A-Z, Wardening by Wendrie Heywood. Bookmark the permalink. Can anyone recommend a good inexpensive supplier of a wooden notice board suitable for a listed rural MH?